Menopause and sleep difficulties often go hand in hand. During menopause, the fluctuation in a woman's hormones may lead to hot flashes. Hot flashes can leave a woman sweating and uncomfortable. In turn, sleep becomes difficult. By understanding this, individuals have a better chance of finding a way to overcome it. 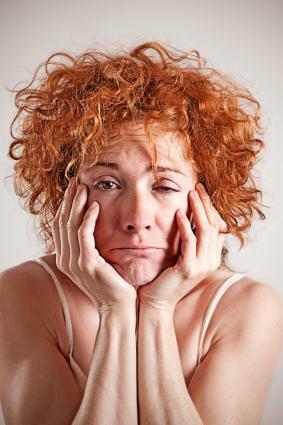 Sleep difficulties associated with menopause often start even before menopause actually begins. During peri-menopause, when progesterone and estrogen production begin to decrease, many women begin experiencing trouble sleeping. According to a study in the Nature of Science and Sleep, 40 to 56 percent of women experience trouble sleeping during their peri-menopausal transition. According to Web MD, peri-menopause lasts an average of four years, though it can be much shorter or longer in some women. During menopause, sleep problems become even more common as the production of progesterone and estrogen ceases. According to the National Sleep Foundation, about 61 percent of menopausal women experience associated insomnia and other symptoms. According to Dr. Keith Wharton, menopause typically lasts one to five years. It can, however, last longer in some women. For those women who do have this complication of menopause, the first step is to speak to your doctor. Excessive menopause complications are sometimes treated with hormone replacement therapy (HRT). This may occur in pill form, through patches or sometimes a cream. According to the American Cancer Society, such treatments can lead to an an increased risk some forms of cancer. A New York Times article reported findings on a study of over one million women that indicated possible associations between HRT and heart disease, blood clots, and strokes. Side effects of HRT may include period-like bleeding, symptoms that mimic PMS, water retention, weight gain, and nausea. While HRT can help with insomnia symptoms, there is not agreement in the medical community regarding whether the benefits outweigh the risks. Doctors are only likely to recommend HRT if the patient is experiencing extreme symptoms, and in the smallest possible dose for the shortest period of time. For most women, taking HRT is not an option as their symptoms are not severe enough. If you wish to remain comfortable sleeping, prepare yourself for the hot flashes. Wear loose clothing. Cotton may be best, as it will absorb the sweat. Consider getting a cooling mattress pad, bed sheets, or pillow. 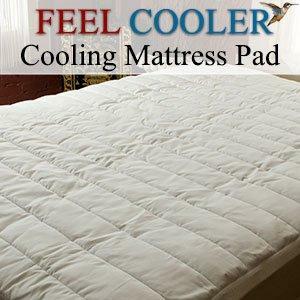 Products like the ISO-Cool Pillow to help ward off hot flashes that can lead to insomnia. Purchasing a cooling mattress may also be an option. Mattresses like the Serta iComfort Sleep System have built-in cooling technology. Even in the middle of winter, try to sleep with several thin blankets rather than one or two large, heavy blankets or a thick comforter. This way, you can peel back layers if you do heat up during the night. Keep the bedroom at a comfortable, but cool, temperature. Also, use a fan or keep the window open to keep air moving. A stuffy room may hasten the symptoms of hot flashes. By improving your sleep hygiene, you may be able to sleep better. This includes going to bed at the same time nightly. Be sure to give yourself enough time for the sleep you need. Try to sleep during evening hours, as the body is able to fall asleep easier during nighttime. While it may be tempting to take a nap, it's best to avoid naps during the day. This way, you are tired when you get to bed and are more likely to sleep. Get plenty exercise during the day so that your body is naturally tired at night. Avoid working out at night so that related adrenaline doesn't get in the way of sleep. Eat a healthy diet that provides your body with the nutrients it needs. Avoid drinking caffeine or alcohol prior to bedtime. If you continue to experience problems with menopause and sleep, talk to your doctor about alternative options and causes. It is possible that you are having sleep problems that are not in direct relation to your menopausal symptoms. Insomnai may be caused by other factors, such as stress, depression or health related sleep difficulties.